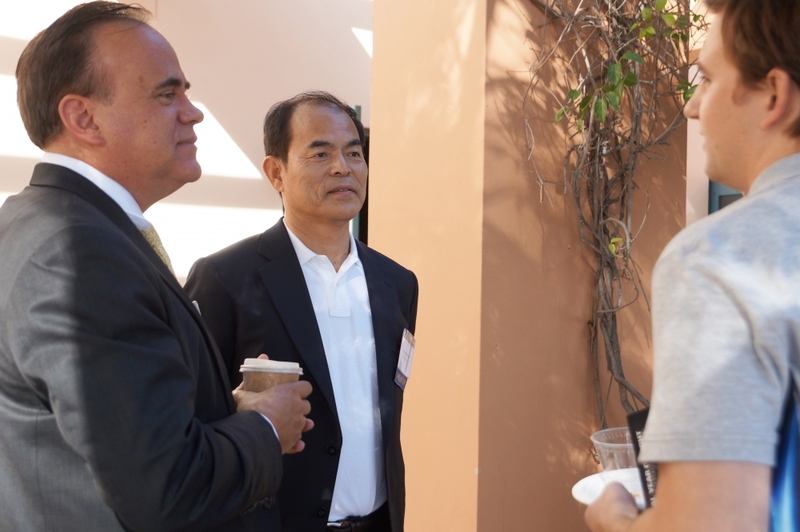 The best and brightest in lighting and light-based research came together Thursday, October 8, for UC Santa Barbara’s International Year of Light symposium. 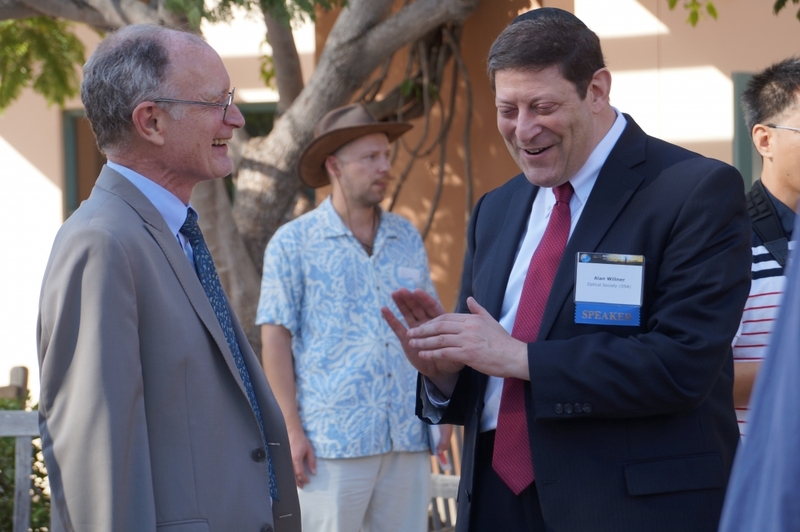 The daylong event at UCSB’s Corwin Pavilion highlighted the science and engineering behind the technology that has come to dominate not only communications and energy efficiency, but also medicine and entertainment. 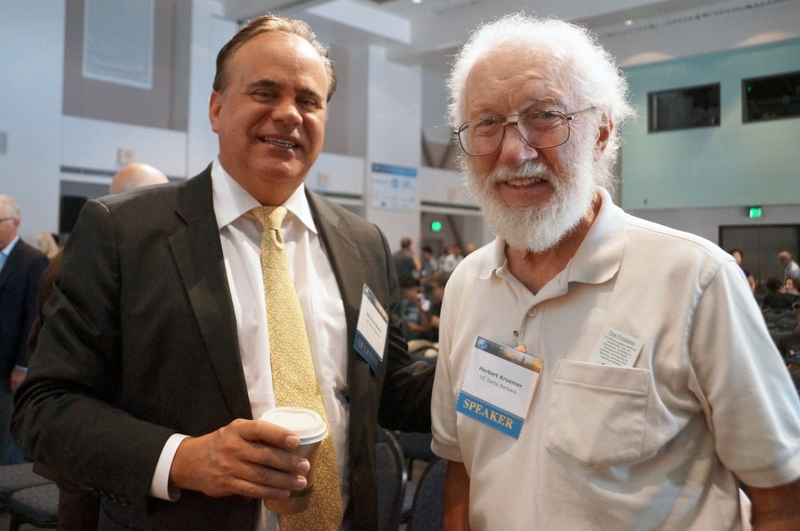 The event, hosted by the UCSB College of Engineering and the campus’s Institute for Energy Efficiency (IEE), was part of the worldwide celebration of the International Year of Light designated by the United Nations. 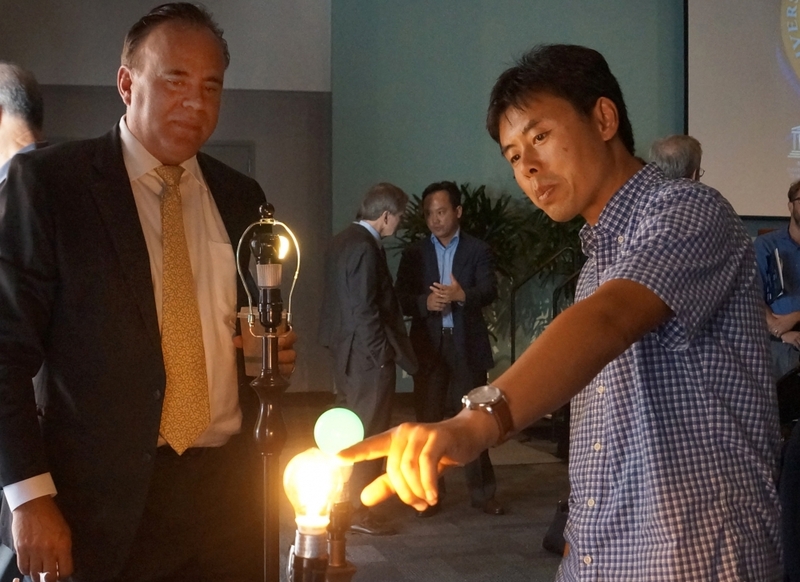 Featured speakers, all on the cutting edge of lighting and light-based technology, included three of UCSB’s Nobel laureates — Herbert Kroemer, Alan Heeger and Shuji Nakamura. Each lectured on his work, while other symposium speakers discussed the many other advances and aspects of light-based research. Indeed, from the fundamental research on semiconductor heterostructures pioneered by Kroemer — technology that continues to underlie today’s light emitters and light manipulators — to the next generation of highly energy-efficient lighting currently under research at UCSB’s IEE and Solid State Lighting & Energy Electronics Center (SSLEEC), UCSB researchers continue to be at the forefront of light-related research. “There’s a lot going on and a lot to do,” said Heeger, who won the 2007 Nobel Prize for Chemistry for work on conductive polymers. Four diverse sessions covered a variety of topics related to the science behind light, from the materials that have been and continue to be developed to generate light and convert its energy for use in various applications, to the wider implications and benefits of progress in light-based technology. Heeger discussed research in polymers — “plastic” solar cells that could be the future of photovoltaics — while Nakamura lectured on the blue LED, for which he won the Nobel Prize in Physics in 2014, as well as ongoing work to improve the already highly efficient lighting. More than 50 of the world’s nuclear power plants could be made redundant by 2020 due to the use of LEDs instead of more energy-intensive lighting, Nakamura said. Other speakers addressed other light-related topics. Stanford University physics professor Eva Silverstein gave a talk on the ancient light of the early universe, while Bill Parrish, founder and chief executive officer of Seek Thermal, discussed the infrared spectrum and its use in measuring energy consumption. 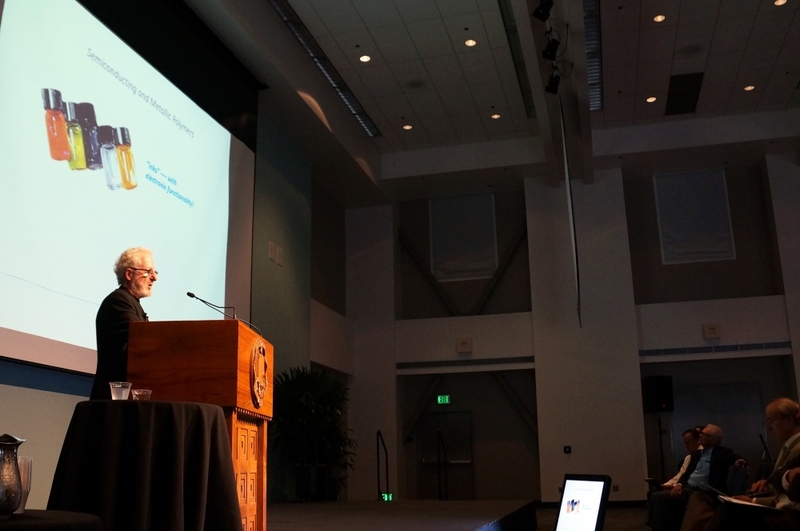 UCSB physics professor Ania Jayich highlighted her work in quantum sensing and imaging, and Dan Morse, UCSB emeritus professor of molecular genetics and biochemistry gave a presentation on the use of light to image biological materials. Light continues to be the way to the future, economically, technologically and in terms of energy efficiency, noted IEE director John Bowers, a professor of electrical and computer engineering and of materials. He discussed the new AIM Photonics, a nationwide federally funded consortium of research and industry partners created with the goal of accelerating the research and manufacture of photonic integrated circuits. These circuits serve as the bridge between conventional electronic (wire) communications and data transfer and the much faster and more energy efficient light-based photonic (waveguide) technology, and promise to meet the looming demand for speed and capacity in communications and data transfer. Bringing manufacturing into the mix will not only hasten the development of the technology but also provide high-paying jobs to the nation, he said. “The United States is great at inventing technology, but we’ve kind of lost the way to manufacturing many things in the U.S.,” he explained, pointing out that what gets invented here often winds up being manufactured in Asia. AIM Photonics and similar federally funded manufacturing consortia represent an effort to bring high-tech manufacturing back to the country, he added. And while the LED continues to revolutionize lighting and electronics, Steven DenBaars, UCSB materials professor and co-director of the campus’s Solid State Lighting and Energy Efficiency Center, is already working on the next generation of LED technology and the emerging laser-based lighting technology that promises even more efficiency and power than that of LEDs. Integrated into networks, Li-fi, as it has been called, can provide both light and information transfer in data-heavy networks, such as hospitals that employ sensors to monitor patients, or indoor environments where conventional wireless signals may be obstructed or severely attenuated. “We think the future’s already starting to get here,” he said. Steven Chu, 1997 Nobel winner in physics and former U.S. Secretary of Energy, brought the symposium to a close with a wide-ranging talk on the role of light from the beginnings of life on earth to its many uses in modern times, spanning fields such as the economy, medicine and climate change science.